I’m no stranger to mopping floors. I actually like it. I worked in restaurants from age 14 to 22 starting as a dishwasher, progressing to busser and then spent my last 4 years working in restaurants as a server. As a dishwasher, I mopped a ton of floors every shift. Same as a busser. As a server, less so, but once in a while it needed doing. Mopping is one of the best ways to get your floors clean and using a mop beats getting on hands and knees. However, you definitely want the right mop for the job. There are many mop options – we list them all out and describe them below. Learn everything you ever cared to know about mops right here. FYI – click images to learn more about each mop. Cut-end mops are among the least expensive mop types that you can purchase. If you want to be able to mop your floor without having to spend too much money on materials, you will likely want to buy one of these. You’ll be able to find them at just about any store that carries cleaning products. They work well to clean up small messes and to generally mop your floor. The problem with cut-end mops is that they aren’t necessarily incredibly durable. Depending on how often you mop, you may wind up needing to buy a new one of these mops several times a year. If you mop infrequently, then this issue may be mitigated somewhat. Regardless, it is important to be aware that these mops do not last forever. You can’t take the mop head off of this mop to clean it very effectively either. You should never put the mop head in a washing machine, as it will wind up being destroyed. This can be a bit inconvenient, but you will want to try to clean it up sometimes. This helps you to avoid mold problems and keeps your mop sanitary. Looped-end mops are even more absorbent than the cut-end mops mentioned above. This makes them even easier to use when you need to clean up spills. One of the primary reasons that people purchase mops is to be able to clean up spills when there has been an accident. 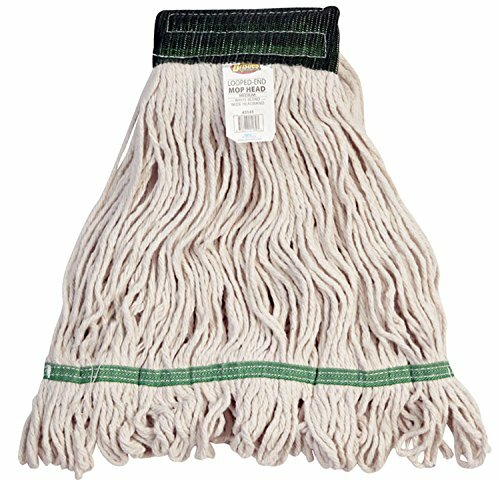 Owning one of these mops is going to make things very simple on you. Another good reason that you will want to consider purchasing a looped-end mop is that they are machine washable. You will be able to take the mop head off of the mop and wash it up. This can extend the life of the mop significantly. You will need to replace the mop head eventually, but being able to prolong its life will help to save you a bit of money. 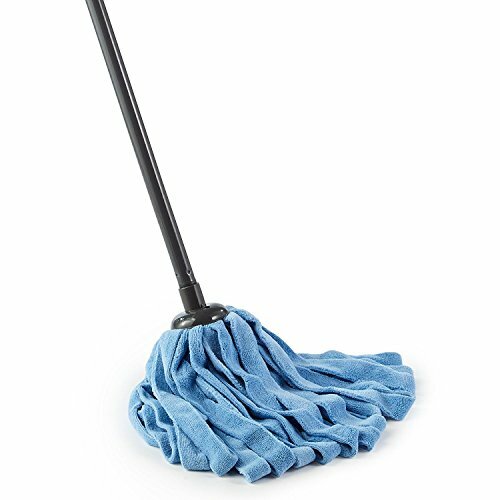 These mops are very durable and will be able to clean up even large messes with ease. This is the type of mop that you will generally see janitorial staff using at commercial facilities. It is meant to do big jobs, but it can also work perfectly in your home. If you need a reliable mop, then this one is going to work out great. Microfiber mops actually have some significant advantages over both cut-end mops and looped-end mops. The microfiber material is much easier to keep clean than the aforementioned mops, so it is a more sanitary option. Other types of mops have the tendency to become moldy after being used for long periods of time. This usually ends up with you having to throw away the mop heads and then being forced to buy new ones. If you own a microfiber mop, then you will be able to simply clean and reuse the microfiber mop head many times. They can be washed over and over again without degrading. Even if you wash a microfiber mop hundreds of times, it should still be in great shape and will be ready to help you complete your cleaning task. This makes it one of the most cost-effective methods that is available to you. There are some negatives about microfiber mops that you will want to be aware of as well. The biggest problem with microfiber mops is that they are not as absorbent as the materials listed above. This means that they won’t soak up spills quite as easily as other mops. Even so, you will be able to accomplish your mopping with a microfiber mop. They also aren’t as good for giving your floors a deep scrubbing as some of the other options on this list. You will want to use a microfiber mop for general maintenance cleaning. They are superb at this task and will work well for you for many years. You may need another more heavy-duty mop for when things get incredibly dirty. Flat mops are convenient to use when you need to mop without using too much water. Most people who purchase flat mops will use just a little bit of cleaning solution and mop their floor with it. You can actually mop things up really effectively by doing things this way. You’ll be able to clean up the area without getting things too wet. There are some types of floors that you are not supposed to get too wet. Good examples of this include hardwood flooring and vinyl flooring. Using too much water can wind up damaging the floor and this is going to be very counterproductive. If you want to avoid these types of problems, then you should make use of a flat mop instead of traditional mops. Luckily, a good flat mop is going to be very simple to use. You’ll be able to use the mop to get right up against the corners of your walls, too. In some ways, using a flat mop is actually easier than using a traditional mop. Once you have become used to the intricacies of flat mops, you’ll be cleaning up your floors really nicely. 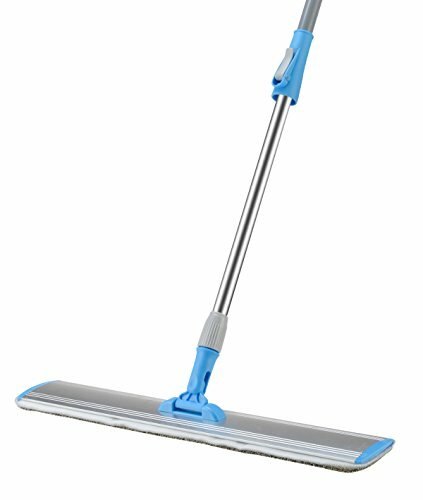 This flat mop is 18-inches long and capable of complete rotation. It is made out of aluminum so that you can count on it to last you for a long time. The head of the mop is made out of microfiber and it can be removed to be cleaned. This really increases the lifespan of the mop, so you’ll definitely get your money’s worth out of this one. Steam mops can be really nice when you want to remove stains or other gunk from your floors. There are many different models of steam mops on the market that you will be able to peruse. If you want to buy a high-end model that can also steam clean your carpets, those are going to be available for your consideration. Most people wind up buying the more affordable versions that are simply meant for mopping your floors. What these steam mops can do is use steam to help remove built-up dirt and grime from your floors. 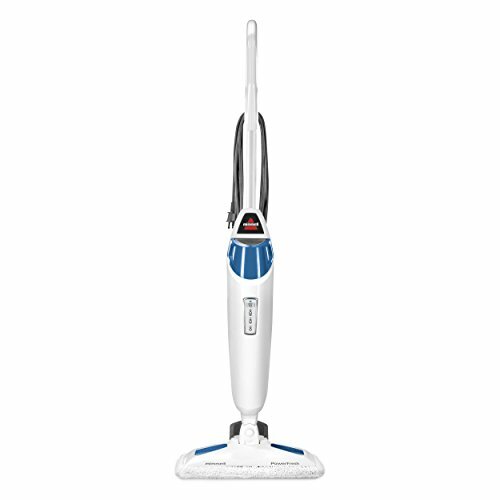 If you have particularly dirty floors that you need to clean, then owning a steam mop is really going to help. You can break up the gunk that is stuck to your floors and clean it up without it being too much of a hassle. These mops are really good at what they do and you’ll be happy to own one. 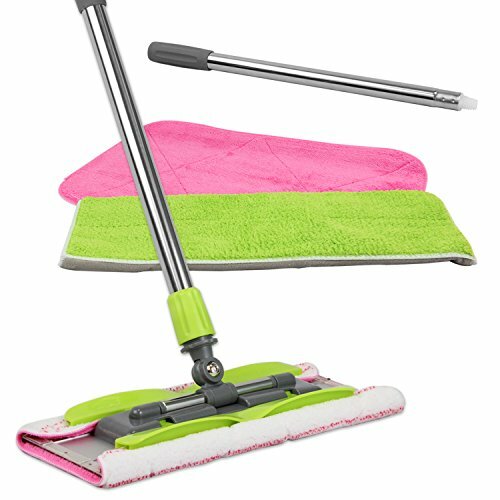 There are many styles of these steam mops on the market and you’ll want to get one that will suit your needs. The product being shown here is a great general purpose steam mop that you can make use of in your home. It will allow you to control the steam output with three convenient settings. You can choose from low, medium, and high steam to finish up your mopping with ease. The head of this steam mop is capable of swiveling too, and this can be very convenient when you’re trying to reach certain spots. The water tank of this steam mop is removable so that you can replace the liquid and you can even use fragrance discs to add a delightful scent to the room. The spring breeze scent is included with this model and there are other scents that you can purchase, too. It’s a good option for people who want to have serious cleaning power. Sponge mops are another method that people use when they want to clean up spots and spills on the floor. Everyone knows that sponges are very absorbent, so when you combine the functionality of a sponge with that of a traditional mop, you can see how that would come in handy. If you use a sponge mop to its full potential, then it will be able to help you clean up even a really dirty section of your floor. Some people find them to be significantly easier to use than many of the other mops mentioned above. Scrubbing the floor is actually somewhat simpler when you have a sponge mop. It is easier to scrub out a spot than it would be if you were using a microfiber mop or one of the cut-end mops. It’s just simpler when you are trying to get traction and need to apply pressure to an area of your floor. For this reason, many people use sponge mops exclusively in their homes. The sponge mop that is being used as an example here is a great product. You will be able to change out the sponge portion when necessary. It is very simple to put a new sponge in the mop and you’ll be able to use each sponge for quite a long period of time before needing to replace it. The sponge is incredibly absorbent and will work excellently to clean up your floors. It also features an extendable handle for your convenience. This can make it a bit simpler to get to those hard to reach places. If you want to own a mop that is going to make your life a bit easier, then this mop is going to be one worth purchasing. You’ll have an easy time using it and it has the potential to help you cut down the amount of time that you have to spend mopping. Dust mops are a little bit different from most of the other mops that are on this list. 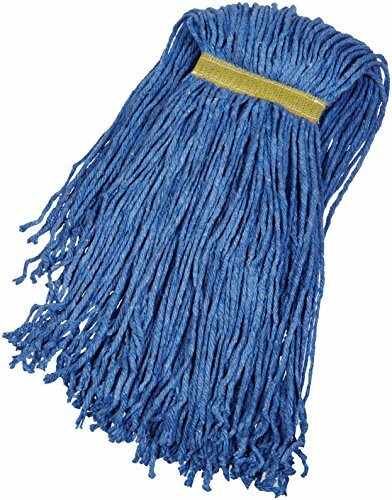 The majority of all mops are what could be considered wet mops. A dust mop is a dry mop that you don’t have to use cleaners or water with. You are simply meant to use this mop to get rid of a little bit of dirt and dust off of your floor. You might be wondering whether or not it is actually going to be worthwhile to purchase one of these dust mops. The answer is most definitely yes, but it depends on what your needs are. If you are already in the habit of sweeping regularly, then you may not have any huge need for a dust mop. A dust mop really does function like a broom in many ways, so you will be using it to do the same thing that you are likely already doing. A dust mop can be more convenient to use than a broom, though. You can glide a dust mop across your floor very smoothly, picking up dirt and dust along the way. It will be a very handy tool when you are just trying to tidy up the floor quickly. Owning a dust mop makes cleaning up a little bit easier and that is why they are so commonly seen in people’s kitchens. It’s also possible to purchase one of these dust mops without having to break the bank. They don’t cost a whole lot of money and you will be able to get a lot of use out of them. This one that is being shown here has a microfiber head and will work excellently for your needs. 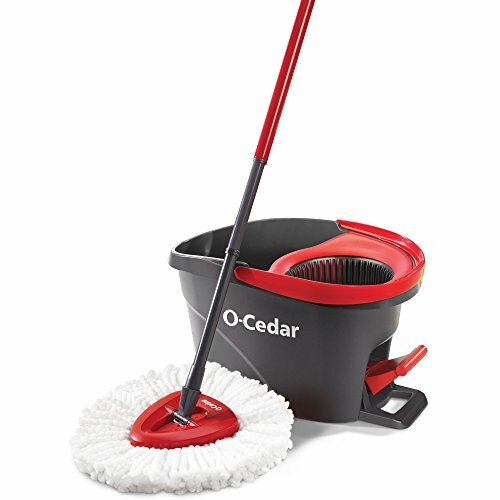 If you want to be able to clean up your floors quickly, but don’t want to take the time to use a wet mop, then this will be great to use. Another interesting way to mop your floor is by using a spin mop. Spin mops pretty much function the same as a traditional mop, but they are a bit different. You can spin these mops to help eliminate stains and get your floor clean faster. It can be really convenient to be able to clean up dirty spots easier without having to scrub them really hard. Sometimes these spin mops are also referred to as twist mops. You will be making a twisting motion with your wrist to spin them. Once the mop starts spinning, it will be able to be put to work to scrub out stains and other dirty spots of your floor. They have become a very popular option that people use every day to keep their floors looking fantastic. The spin mop being shown here has several characteristics that make it stand out as a good purchase. The first one is that it features a telescoping handle. You will be able to adjust the handle of the mop to make reaching certain places easier than ever before. It makes it so that you won’t have to bend down or try to get into an awkward position just to be able to mop one particular spot. This also comes with a convenient bucket and basket. You’ll be able to roll it around your house and clean everything up very effectively. This would even make for a good purchase for commercial purposes, as it truly is a very effective mop. It is available at an affordable price as well, making it a great purchasing option for anyone who would like to own a spin mop. 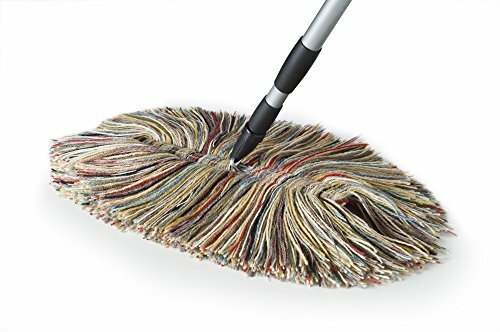 If you really want to give your floor a deep cleaning, then it can be beneficial to buy one of these brush mops. They are very good at allowing you to scrub the floor rigorously. If your floor has a tendency to get rather dirty, then you will like having one of these mops around. They are perfect for rooms that get muddy or have a lot of sticky spills. This is essentially the combination of a scrub brush and a mop. 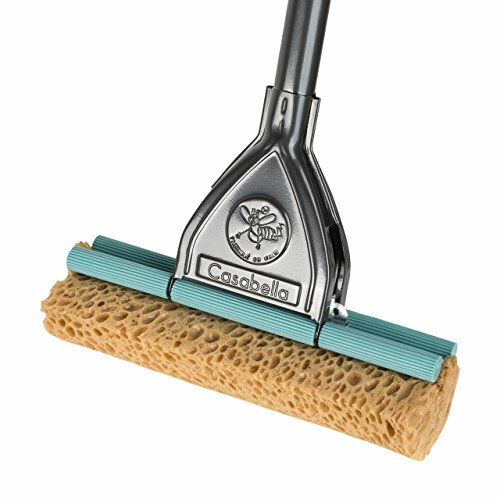 You can use this brush mop to give your floor a general mopping, but it is best used as a way to scrub out dirty spots. You will be able to work the bristles of this brush into the floor to eliminate dirt very effectively. It won’t be too difficult to eliminate even stubborn spots. Using a traditional mop to accomplish the same thing would not be nearly as easy. It would take you a lot longer to scrub out stains and other dirty spots. As long as you use a little bit of soap and put some pressure on things with your brush mop, you should be able to make your floor look spotless. It’s a great method for cleaning up your floors and is very popular in kitchens. This brush mop here is very affordable, too. You won’t have to pay an exorbitant sum of money to get one of these and it will certainly come in handy. 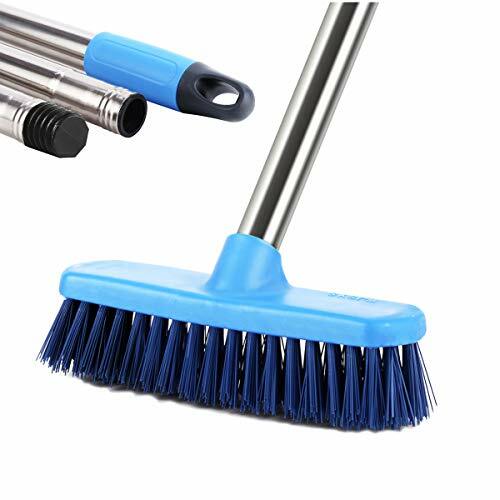 The best thing for you to do is to use this brush mop in conjunction with another traditional mop. You can use this one to scrub out dirty spots and the normal mop to make your floor shine. There are also mops on the market that are made to be used with common rags. This may seem a bit unusual at first, but it is actually more common than you may realize. A rag can be an effective mop head that will allow you to clean your floor very nicely. You will simply be attaching a rag to the mop stick before mopping things up like you normally would. To make use of this method, you will first need to buy some type of mop stick that you can use. Sometimes, these mops will be referred to as jaw mops or mop clamps. They are meant to be used with mop heads that you can buy in the store, but you can also attach rags to them to accomplish the same thing. This can help to save you a bit of money and you won’t need to replace your mop heads so often. A rag can really make for an effective mop, so long as you are using a decent one. Try to use a mop that is absorbent enough to make for a good mop head. If you use it right, then you will be able to mop up your floor just like you normally would. This can be very handy when you don’t want to have to go to the store to buy a new head for your mop. Of course, using a rag may not be quite as desirable as using some of the other mops that are mentioned above. It is possible that your rag won’t be as easy to use as some of the other mop styles. Even so, it can work out just fine and help you to save a few dollars. If you want to make use of this method, then you will know that it is out there. In modern times, people like to try to do things as conveniently as they possibly can. Finding the time to mop the house isn’t always easy when you are a busy individual. It’s very important to keep your house clean though, so people have been turning to different options. There are those who hire professional cleaners to take care of everything and then there are people who buy robot mops. Robot mops are becoming more sophisticated all the time. You have likely heard of robot vacuums, since they are starting to become more common. 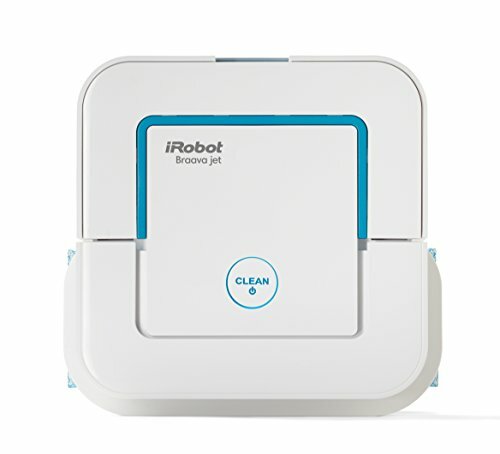 This robot mop actually works very similarly to the robot vacuums that everyone knows and loves. They usually function as vacuums as well, but have additional mopping features added in. When you own a robot mop such as this, you will be able to set it up to operate automatically. You place it in the room that you need to have mopped and start it up. It will roam around the room and mop it up very effectively. This is good to do before you go to work, as it can simply mop the room for you while you are away. This is one of the most convenient mopping methods on the market. It may not be quite as thorough as some other mopping methods, but it is completely hands off. You won’t have to take up any of your time mopping when you have a robot that can do it for you. Robots are likely to become more sophisticated over time as well, so this method may become the most common way to mop moving forward.